A friend asked me to help with his daughter’s science project. Of course was my answer even before asking what the topic/subject was. Newton’s Third Law was the answer. A dozen ideas came to mind and then I read the rules: no electric components, no CO2 cartridges, no fans… no fun at all! At least they didn’t disallow a hand pump so I immediately started thinking about a compressed air pumped rocket ‘engine’. 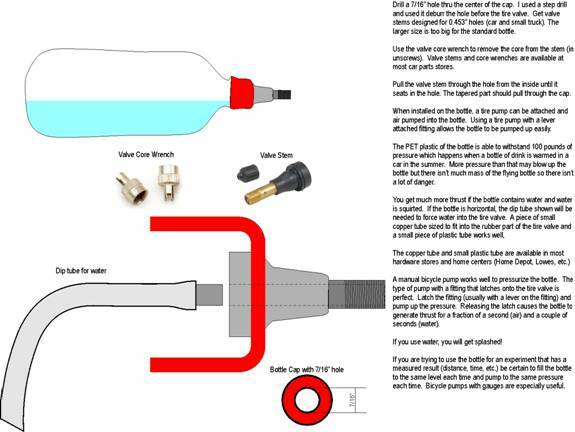 Remembering coke bottle rockets (2L bottles and a foot pump), I tried to assemble a combination of easily available parts to make the power source. A bicycle pump was a good starting point. Complete with a pressure gauge (alibi not very accurate), Home Depot supplied a pump for $7.00. It has a clip on fitting for the standard tire valve which is nice because it provides a release mechanism (flip the level and wiggle the fitting to launch. Fitting the 2L bottle with a tire valve turned out to be easier than expected. I bored a 7/16 hole through the cap and then fitted a standard replacement tire valve from the auto parts store. The standard auto tire valve fits into a .453 inch hole which is close enough to 7/16 to fit just fine. Plastic is more forgiving than metal tire rims. Don’t forget to unscrew and discard the valve stem otherwise the air can’t escape! The engine when pumped to 20# was able to send a plastic panel with 4 casters across the room. It was tried using water (half full) and a dip tube. The launcher (person) got very wet and the ‘car’ went way up the driveway. Such a simple rocket engine when under $20 (including pump) and I’m sure you can find many school projects to power.